Tonnage selection when press-brake bending can spell the difference between a quality, economically produced part or a costly reject. Not only that, but incorrect tonnage can spell danger for tooling, machinery and operators. Exceeding maximum tonnage on the press brake for any type of application can risk severe damage to the machine, cause tooling to break and dangerously compromise operator safety. When press brakes experience over-tonnage, the ram and bed can suffer serious deformation, which often cannot be repaired. Learning how to select the appropriate tonnage for individual bending applications can help avoid irreparable damage to the press brake and tooling, and protect operators from injury. Maximum tonnage is the maximum amount of force that a press brake can exert to form sheetmetal. This typically is expressed as tons/ft. or kN/m. Every machine has a different threshold or rating for the maximum amount of force produced. Tooling, holders and adapters also have tonnage limits. An operator must understand these limits in order to safely utilize the maximum range of applications for any given press brake. In general, the thicker the material the more tonnage or force required to form it. The type of material also plays a large role in this equation. Yield strength varies tremendously for different materials. For example, forming soft brass or copper requires much less tonnage than the same thickness of mild steel, and forming stainless steel requires much more tonnage than forming mild steel. Keep in mind that tonnage ratings incorporate a length component. For example, a rating of 30 tons/ft. equates to 2.5 tons/in. If an application calls for a force of 50 tons across a 10-in.-long form, that equates to 5 tons/in. or 60 tons/ft. Some applications require that a large amount of tonnage be placed in a small area. The press brake may have the overall tonnage required to achieve the form, but if the tonnage must be concentrated in one location (known as isolated tonnage), then the tonnage rating of the tooling and holders also must be considered. The method of bending also plays a role. Air bending, bottom bending and coining all require various amounts of force. Air bending requires the least amount of tonnage, followed by bottom bending then coining, which requires the greatest amount of force. Each bending method has benefits and limitations, but in general, bottom bending requires at least twice the tonnage of air bending, and coining 5 to 10 times the tonnage of air bending. To assist in calculated needed tonnage for press-brake operations, we present the accompanying air-bending force charts. The charts supply an estimated tonnage for air bending a given thickness of mild steel in a given V-opening. The numbers in the white and gray boxes running diagonally from the top left corner to the bottom right corner of each chart denote the estimated tons/ft. required to perform a certain bend. If planning to bottom-bend or coin, use the charts to find the air-bending force required, and then multiply using the equations detailed above. Important: The data in this chart is based on bending mild steel with a tensile strength of about 60,000 psi. Start with the material to be formed as listed on the left and follow the row to the right until reaching the numbers. 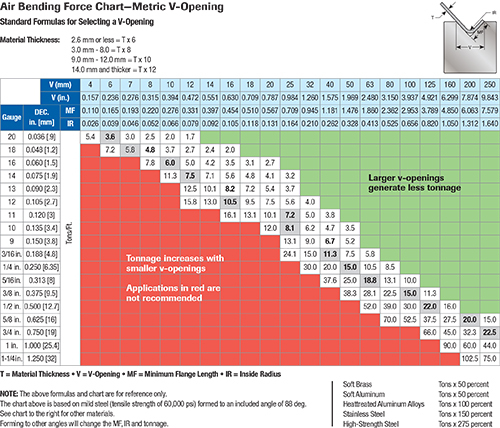 Notice that the tonnage numbers decrease from left to right, due to the fact that a larger V-opening requires less tonnage for that same material thickness. A shaded box represents the recommended V-opening for a particular material thickness. A red-shaded box indicates that the V-opening is too small for a given material thickness. Tonnage limitations may dictate that a larger V-opening is required. But before jumping to a larger V-opening, consider how that will affect the form to be made. Will the larger V-opening accommodate the flange length or change the inside radius? Or, will a radius change in turn change the flat pattern or blank development? 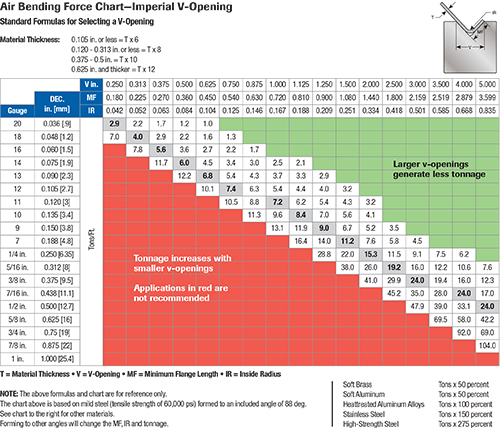 Follow the 10-gauge row in the Imperial V-Opening chart to the shaded box. The number is 8.4. This is the estimated tons/ft. required to form this application. Then follow that column straight up and notice that the V-opening is 1.125 in. But what if the machine only has a 1-in. V? Jump to the 1-in. column and follow it back down to the 10-gauge row. Notice that the tonnage number now is 9.6 tons/ft. This is still an acceptable tonnage to apply on the tooling, but does the brake have the capacity? Starting with the 0.250-in. row, follow it to the number in the shaded box, 15.3 tons/ft. (if a 2-in. V is used). But remember that this is stainless steel, which has a higher tensile and yield strength than mild steel. The factor for estimating this stronger stainless-steel material is 150 percent. (Remember that this is an estimate only—different grades of material will take more or less force, i.e., type 201 stainless steel may have different properties than a type 304.) So with the 150 factor included, we arrive at 15.3 x 1.5 = 23 tons/ft., and with 10 ft. to bend, the estimate is 230 total tons required. In using these charts, keep in mind that it is not recommended to run at maximum capacity of the machine 100 percent of the time. Article supplied by Wilson Tool International, White Bear Lake, MN; tel. 866/752-6531, www.wilsontool.com. Nice article! Overloading with limits is the biggest problem that could effect and damage the tool and the machine. And even the R of die makes the role with the tonnage.